Purpose: Tumor resistance to alkylating agents such as carmustine (BCNU) has been found to be associated with intracellular expression of O 6 -methylguanine-DNA methyltransferase (MGMT). 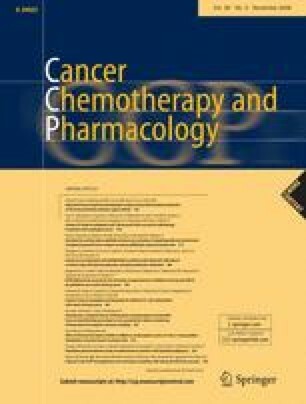 Administration of O 6-benzylguanine (O 6-BG), a substrate that inactivates MGMT, may help overcome chemotherapy resistance. We performed a phase II study to explore the activity of O 6-BG in combination with BCNU in patients with advanced soft tissue sarcoma. Experimental design: Informed consent was obtained from patients with metastatic soft tissue sarcoma naïve to systemic chemotherapy (adjuvant chemotherapy allowed). Patients received O 6 -BG 120 mg/m2 I.V. followed by BCNU 40 mg/m2 I.V. Treatment was repeated every 6 weeks until disease progression or development of unacceptable toxicity. Results: No objective responses were observed in 12 enrolled patients. Four patients exhibited stable disease lasting 11–25+ weeks. The median overall survival was 16.9 months (95% CI, 2.9–NR). The most common grade 3–4 toxicities were neutropenia, thrombocytopenia, and anemia. Depletion of MGMT activity was demonstrated in peripheral blood mononuclear cells. Immunohistochemical estimation of MGMT expression from archival tissue ranged from 20 to 99% positive staining cells. Conclusions: Observed toxicities were consistent with previous studies of O 6-BG plus BCNU. The degree of MGMT expression was variable in this small sample of heterogeneous sarcomas. Further development of this regimen and dose for the treatment of soft tissue sarcoma is not warranted due to the lack of objective responses. Supported by grant #U01CA63187 from the National Cancer Institute to the University of Chicago and University of Chicago Cancer Research Center.